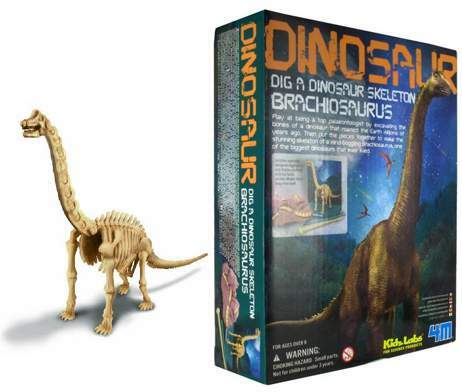 Did you know that to supply sufficient oxygenated blood to the brain of Brachiosaurus, the heart and blood vessels of Brachiosaurus had to be very strong, Also known as the Dig-a-Dino kit, there’s so much for a future paleontologist to learn from this 4M Kidz Labs dinosaur skeleton excavation kit! It’s been suggested that its blood pressure could be as high as four or five times that of a human. 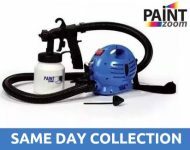 Look for more fun facts about this spectacular beast and challenge your friends with the Kidz Quiz – 10 sets of questions and answers included in this science kit! Learn to be a paleontologist as you excavate the skeleton of the gigantic Brachiosaurus, one of the dinosaurs that ruled the Earth in prehistoric times. 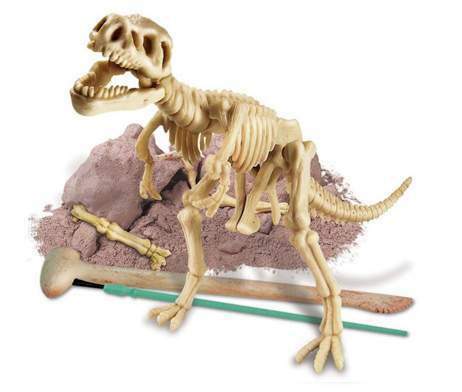 Free the dino from the plaster block with the specially designed digging tool, then assemble the skeleton. This science toy is 11 inches (28cm) long! Pose it and display it. It’s so cool! This is a fun science project for the whole family. Collect all of them to create your own dinosaur kingdom Excavate a realistic looking Brachiosaurus dinosaur skeleton from a mound of clay earth, then assemble it Each Brachiosaurus kit includes an easy to assemble dino skeleton in an unearthed block, excavation tool, brush, fun Kidz Quiz facts and instructions.